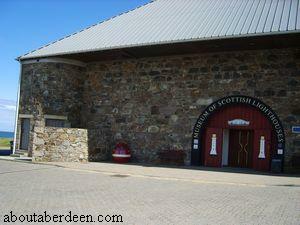 The Scottish Lighthouse Museum hosts the largest collection of lighthouse lenses and equipment. There's lots of exhibits to keep young and old entertained and is quite interactive as many items can be touched and played. For example maps of where Scottish lighthouses can be light up by pressing buttons, lens lights can be re-directed and altered and bells rung. Some rooms have audio visual displays which delve deep into the history of Scottish lighthouses. Children can dress up in the lighthouse keeper jacket and hat. Allow about an hour to tour the museum, then another hour for the lighthouse tour. Entry to the lighthouse is by timed tour. Whilst waiting you can browse the well stocked gift shop where there is a range of lighthouse books and gifts or tour the museum. Listen out for the bell ringing to announce the start of the tour. The tour begins with a history of Scottish lighthouses and then a history of Kinnaird Head Lighthouse. A short walk from the museum, past lines of fishing net posts and buouys takes you to the new automated lighthouse lens and light which flashes every 15 seconds and can be seen 12 miles out to sea. The foghorn next to it is no longer used, which must be a relief to the locals! From here another short walk takes you to the entrance of the lighthouse. There is no disabled access for the lighthouse as the tour consists of climbing up to the top of the lighthouse (don't forget to get the children to count the steps so that they can win a certificate) and visiting each room. The unique feature of the Kinnaird Head Lighthouse is that it was built using an existing castle structure, the Kinnaird Castle, which was built several centuries earlier. The Kinnaird Head Castle dates back to the 15th century and was built by the Frasers of Philorth and they changed the name of burgh from Faithlee to Fraserburgh (cited in Castles of the Clans: The Strongholds and Seats of 750 Scottish Families and Clans by Martin Coventry). The lighthouse was constructed in 1824. The lighthouse keepers cottages were built in 1902. 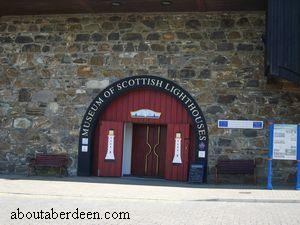 The lighthouse was closed in 1991 and given over to The Scottish Lighthouse Museum Trust and Historic Scotland. The cottages can be entered where a range of uniforms and old photographs and equipment can be viewed. The lighthouse tour begins in the boiler room where original equipment can be viewed. More steps upwards takes you to the duty room and relief lighthouse keeper rooms, with original furniture and equipment. Up more steps takes you to the lenses and light area. Look out for bullet holes from when the lighthouse was attacked by German planes during The Second World War. The tour then takes you onto the balcony of the lighthouse. This can be quite windy and isn't for those afraid of heights! Those who do venture out will be rewarded with some magnificient views of the Buchan Coast. Those who don't can visit the cafe to see these views over a leisurely drink, snack or meal. Don't worry about thinking yourself a feartie - winds of up to 143mph have been recorded at the lighthouse! Directions- Head towards Fraserburgh on the A90. At Fraserburgh follow the signs which take you onto the A952. The museum will be sign posted from here. There is ample parking at the museum and toilets can be found by the gift shop. There is facilities for the disabled. Sir Alexander Fraser had a daughter called Isobel who he didn't let mix with local people. When her father was away on business she took in a stranger who was a piper that sought shelter from a snowstorm. They got to talking late into the night and when he left in the morning, they knew they had fallen in love. They would meet in secret, but unfortunately Sir Alexander found out about them and forbade them to meet. The couple arranged another tryst which Sir Alexander found out about and locked Isobel in her room. He then met her lover and locked him in chains in a cave below the Wine Tower of the Castle. Unfortunately a storm broke and swept the sea into the cave, drowning her lover. The next day Sir Alexander intended to take Isobel to the cave so that her lover would be beaten down to renounce any desires of marriage. Sir Alexander did not realise he had drowned. When he took Isobel to the cave, she ran in and found her lover dead and still locked in chains. Horrified and distressed she ran to the Tower and flung herself off and onto the rocks below. The cave thereafter became known as The Piper's Cave and the ghost of the piper can be heard playing for Isobel. Whenever a storm gathers up a ghostly figure can be seen wandering between the Castle and the Wine Tower. Graeme Milne in his book The Haunted North: Paranormal Tales from Aberdeen and the North East describes the hauntings that take place in the former Lighthouse Keepers Cottages and accounts of visitors to the Kinnaird Lighthouse who have seen the sudden appearance of old fisherfolk. In late 2006 and early 2007 the Kinnaird Head lighthouse was given a fresh coat of paint. It took six weeks to paint the Fraserburgh lighthouse at a cost of �4,000. In January 2007 thieves stole the antique copper roof top dome from the Fraserburgh Lighthouse Museum. It weighted half a tonne and was secured by steel chains at the car park of Kinnaird Head. Sadly a valuable piece of Scottish maritime history has been lost to the greed of criminals. The 10 feet round and 5 feet high roof top dome was from the Ardtornish beacon on the coast of Mull. The Scottish Lighthouse Museum works closely with local schools to teach them about the history of Scottish lighthouses. For example in winter 2007 Fraserburgh Academy pupils entered a 1001 views of Kinnaird Head competition to design posters that could be used to help advertise and market the Scottish Lighthouse Museum. The Fraserburgh Academy children were invited to The Scottish Lighthouse Museum where they had a tour of the centre, the lighthouse and the surrounding area. This included a lesson in photography so that photographs could be included in posters. In April 2008 many of the 1001 Views of Kinnaird Head were put on display until May in the visitor centre. More haunted lighthouse ghost stories from Scotland. More lighthouses from Scotland .